Do you rule your tribe? If you're the leader of a band of warlocks, you already know that your followers are going to have a few doubts about your leadership credentials if you don't have one critical piece of equipment. One piece that both conveys your power, cunning planning skills, and complete mastery of all sorts of spells and hexes. We are talking of course, about... a warlock staff! 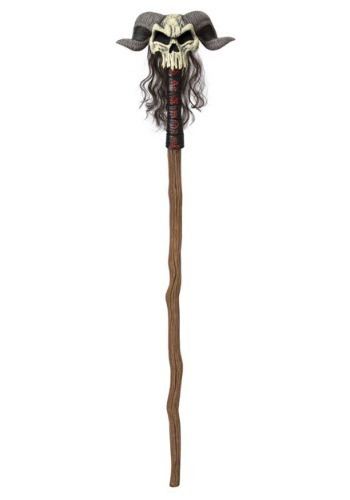 This primitive staff accessory is the perfect way to complete your shamanic look. You can rule over a horde of warriors, voodoo soldiers, or even the darkest orcs who reside deep in the mountain. With a detailed molded skull and horns attached to a faux wood staff, it has a realistic look that will have you commanding attention. We think it's about time your motley band got to bust out of those deep, dark caves and start fighting for your spot in the light. Send the villagers running, look great, command respect... it's all within your grasp. Just complete your costume look with this Warlock Staff, and you'll be ready to rule the tribe! Looked great, but kept falling apart, Nothing a bit of glue can't fix. Looks all right until you put it together, you hand turn it on and it breaks first time. Now I'm going must use duck tape to hold it together.